My messy office is being transformed. Our busy weekend started with a graduation and a track meet. 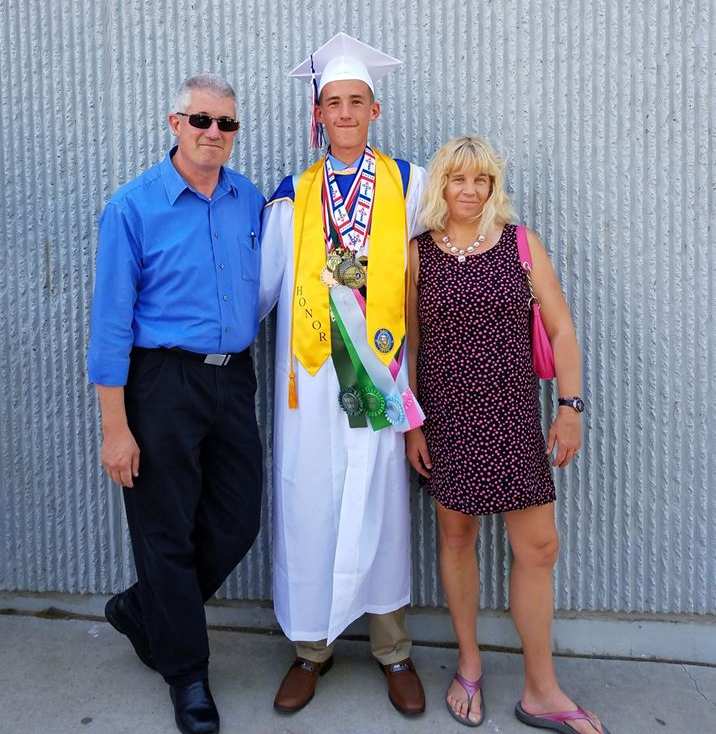 My son graduated high school as the salutatorian of his class! He was almost the valedictorian as he had been number one in his class for 3 years. The girl who was the valedictorian retook a class last summer and had a .033 increase on my son as he had a 4.5-grade point and she had a 4.533-grade point. My son also ran state track the same day and received 6th place with a 4.28-mile time! I am so proud of this boy who is either headed off to the Merchant Marine Academy or the Naval Academy! My son is anxiously awaiting to hear from the Naval Academy. The painting of the doors! 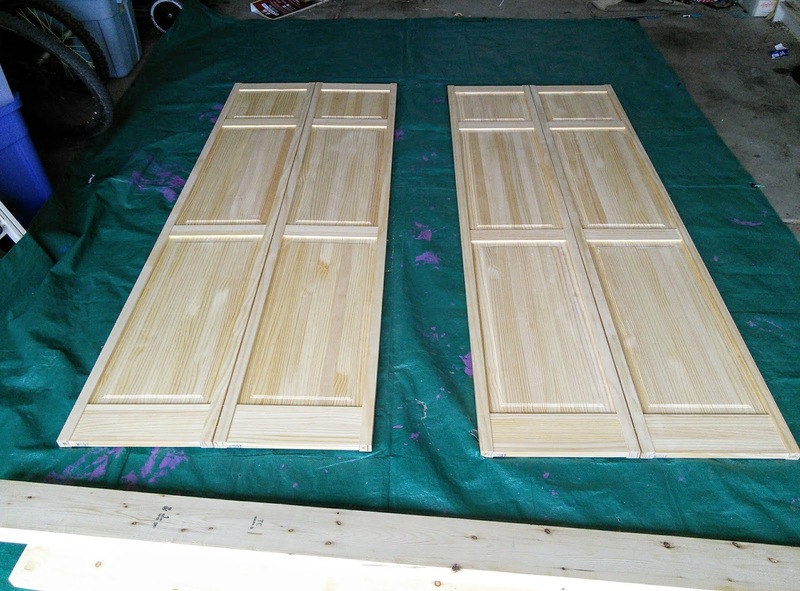 We purchased some pine folding doors at Lowes for the new room and decided to whitewash them with gray paint. I am glad my husband took over that job as he would not let me paint. The last time I painted, I think most of the paint ended up all over me. 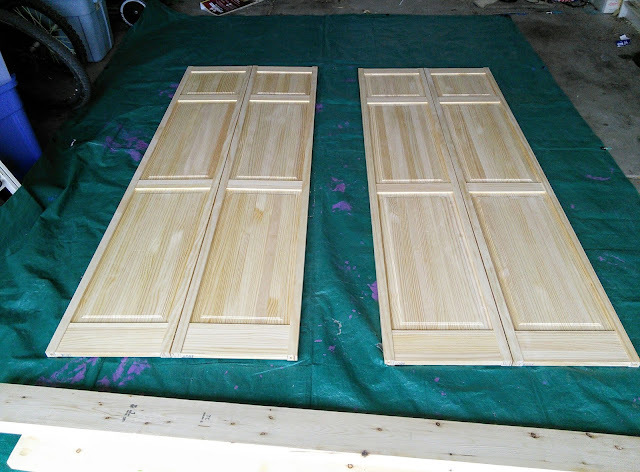 I don't have a process photo of the doors but will show the end result in the next post. I reused the old storage cube system. I decided to incorporate my old storage system into the new room. This smaller cube storage unit would be a great place for me to store products as they get delivered. That way they would be out of sight until I was able to take photos. 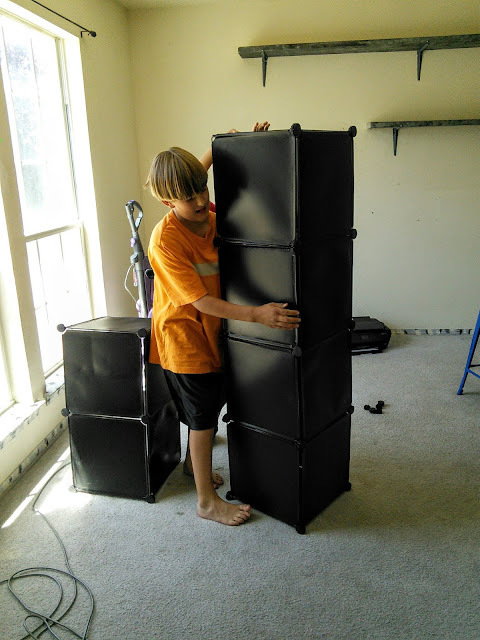 My youngest son was excited to rebuild it for the new room. My husband put together the Ikea storage system with no complaints. My husband had no problems putting together the furniture from Ikea and said that Ikea is the only place that he will buy particle board furniture from. It was easy to put together the shelf unit as the pieces all came pre-drilled and the instructions were easy to follow. 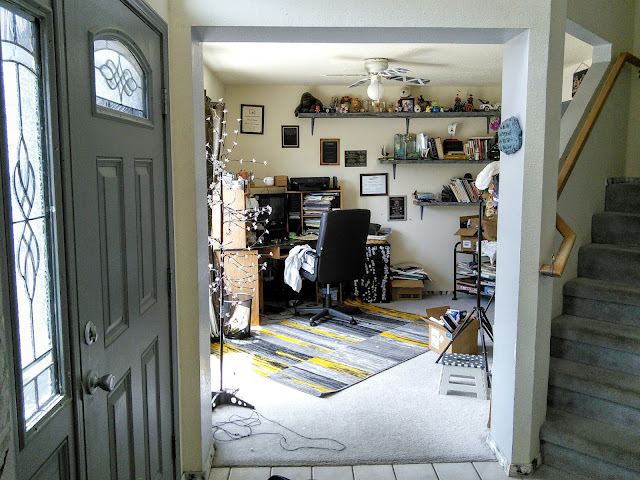 My husband also hung the new doors and moved the wall shelves up higher. The doors gave him some trouble as we did not account for the baseboards in the measurements. It took us all day to build everything but we did it! 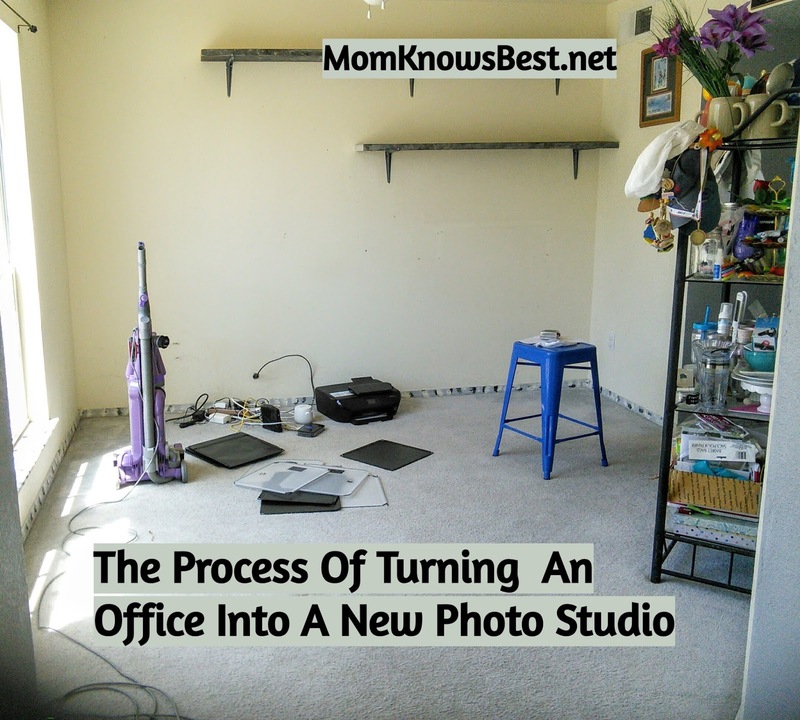 Keep reading to see how the new photo studio/workroom looks. The before picture. Click HERE for the after picture. Such a nice looking office! If only I was handy with repurposing pieces I already have. Love how you decorated it! Those shelves look amazing and provide so much storage! Wow, the new space is looking great. Definitely worth it. Totally love the transformation of your office from what it looked like to current. You have used the space really well. All of the work is worth it! Having an in home studio is an amazing advantage. I can't wait to see how it turns out. We just turned our dining room into a photo studio. You did a great job on the office turning into a photo studio! I wish we had an extra room in our home that I could turn into a photo studio. Way to go! What an awesome transformation and office space- I want that! I think you just inspired me to redo my office. Lovely! Gosh! Look at that space! you did wonders! i look amazing! Refurbishing a space must be so great! But that's a lovely cute office! And that is an interesting rug you have :D And congrats for having your photo studio! You guys did such a great job, the space looks amazing! I love the pop the rug brings to the room! NEW $4/1 TENA® Overnight Product Coupon! SOUP FOR YOU on Cinco de Mayo!